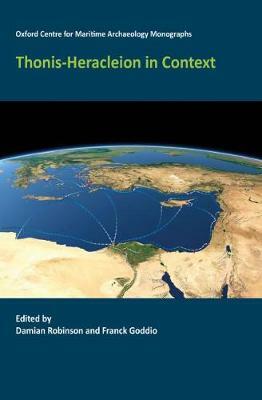 This book presents the papers delivered at the symposium Heracleion in Context held in Oxford in March 2013. Scholars explore the maritime trading economy of the Egyptian port of Thonis-Heracleion during the Late Period and place it within the wider context of maritime trade at this time. Thonis-Heracleion was the gateway to Egypt, the obligatory port of entry and customs point, and a vital node in the trading network of the eastern Mediterranean through which goods flowed into and out of Egypt. The port and its harbour basins contain a remarkable collection of evidence for the maritime trading economy, including customs decrees, trading weights, coin production as well as the remains of sixty-four ancient shipwrecks. These are set within a detailed understanding of the topography of the port-city, which has been investigated by European Institute for Underwater Archaeology under the overall direction of Franck Goddio. This work brings together the latest work of scholars working on the excavation and post-excavation of Thonis-Heracleion. This is contextualised this through a series of wider ranging studies that examine the developing role of the port within the wider maritime trading economies of the Egyptian Late Period, in the Delta and across the eastern Mediterranean.